We recommend you to run vScope on a server with internet access in order to automatically receive updates and fixes from our license server. However it is sometimes inevitable to install and run vScope on a server in a closed network. In order to run such offline vScope you will have to activate the installation with a license file. The license file is either sent to you by an InfraSight rep or you can access all available licenses from the Account & Billing service. If you are trying to install vScope on a machine with no internet connectivity you will end up on a page that is requesting a license file to be uploaded in order to finish the installation. 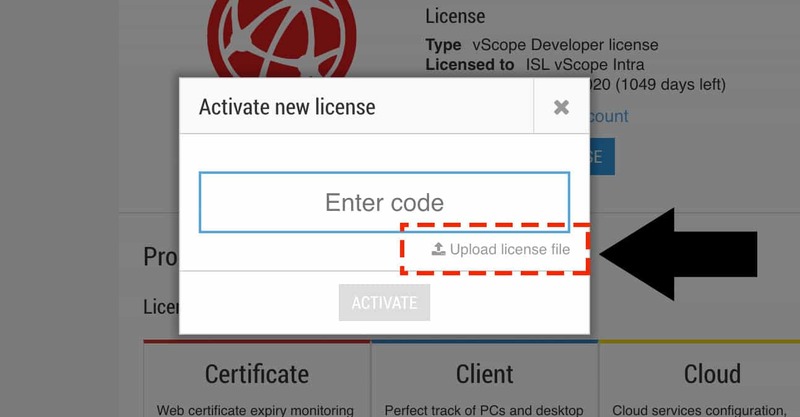 If you already have a vScope running on an offline server you can uploaded the license file from the About page, clicking the “Activate new license” button.